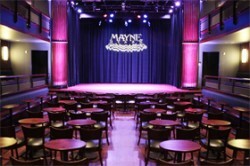 Mayne Stage, the premiere entertainment destination in Rogers Park, proudly presents an eclectic roster of events this summer. Some featured artists include 80’s new wave artists include, Ricardo Lemvo and Makina Loca. Ricardo Lemvo has established himself as a pioneer with his innovative music. This Congo-born artist of Angolan ancestry is the embodiment of the Afro-Latin Diaspora which connects back to Mother Africa via the Cuban clave rhythm. Ricardo Lemvo and Makina Loca will perform Friday, June 29 at 9pm at Mayne Stage, 1328 W. Morse Ave. Tickets are on sale now at (866) 468-3401 or www.maynestage.com.